Discussion in 'Free Website Templates' started by Mimoun, Oct 30, 2006. I really like this template. I am trying to make the menu on the left multi-level ussing the css for a school website. Can anyone help me with this. If not- no worries- really appreciate being able to use the template. Like the site m8, I'm thinking of integrating it into my ASP 2.0. project. I'm working on a number of asp projects e.g. online airline booking system, truck repair business - online management system, etc. Thinking about it, it might not be best suited for my current projects. Hey, i know i'm a newbe to this , but is it possible to downlaod these templates and change the test in them , with limited software? WoW Very neat and clean template , can i use this template for my wordpress blog ? I download it and checked all templates that are also good and professional look. 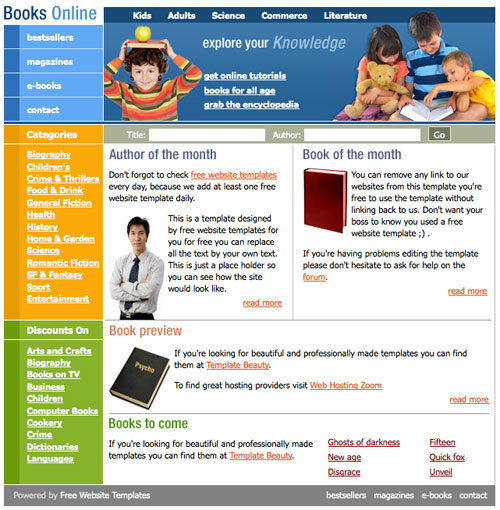 I am using it in my book site thanks for nice templates. Unfortunatley, you cannot use this template in your wordpress blog; however you may create your own wordpress them using the style and images of this template. Login to your account and choose create your own style. is this complete sir? I mean all of its pages are complete? like there's no need to edit anymore ready to use? Love the template and really want to use it. I cant find the slices o the psd. Is there a way to reslice it as the other ebook template on the site automatically shows the slices in photoshop. Could you also tell me the fonts used for the online gif and other headings. Brilliant PS- I love templates! too much nice collection of templates.thanks for such a help,i really appreciate your effort that you have done.wish you best of luck for your career.